A tamari-marinated portabella on a bed of sprouts. Stuffed with zucchini, marinated kale, cauliflower, bell pepper, and onion. 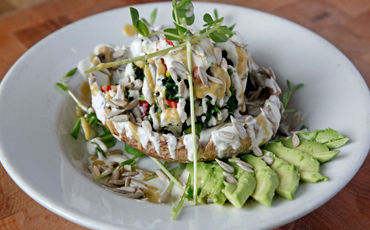 Topped with cashew crème, avocado cheese, sunflower seeds, avocado, and sprouts. 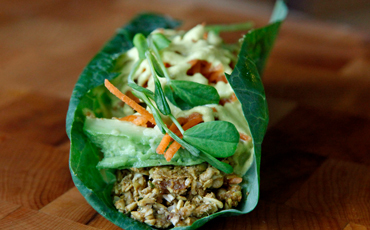 A collard leaf filled with our sunflower seed pâté, avocado, date, onion, and shredded carrot. Topped with curry cashew crème and sprouts. Dehydrated raw flax tortilla filled with our almond pâté, marinated kale, carrot, and avocado. Topped with our sundried tomato sauce and curry cashew crème. 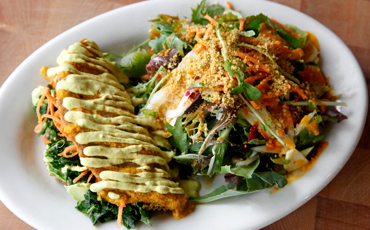 Served with a mixed green salad topped with fresh vegetables, house goji dressing, sprouts, and vegan walnut parmesan.